How do I mark a case as solved in the Service Cloud Admin Console? Once a case has been completed in the Service Cloud Admin Console, it can be marked as solved. Once it is marked as solved, it will appear under the Solved Cases tab in the Service Cloud home page. From the Service Cloud home page, click the Case Number link to the case you would like to open. 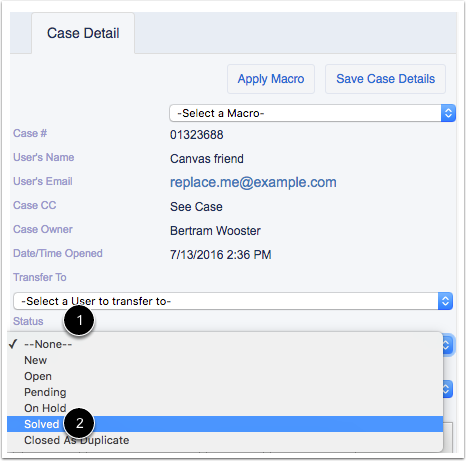 In the Case Detail tab, locate the Status menu  and select Solved . Make sure you respond to the user with a solution if you change the status to Solved. Click the Save Case Details button. Previous Topic:How do I share a post on a case in the Service Cloud Admin Console? Next Topic:How do I use macros in the Service Cloud Admin Console? Table of Contents > Support Information > How do I mark a case as solved in the Service Cloud Admin Console?